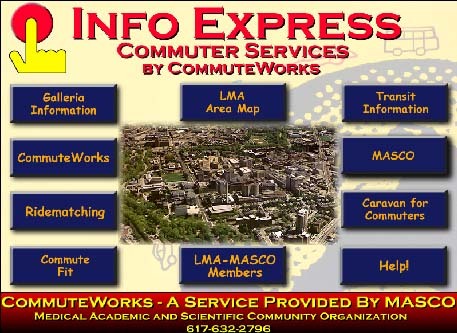 The purpose of the project is to assist medical center personnel and guests with finding their way around and their commute from home to work. FutureTouch developed a commuter and traveler information kiosk for the Longwood Medical and Academic Center in Boston Massachusetts. The kiosk is located at the Galleria Shopping Mall and contains a variety of information including, alternative commute options, mapping, mall information and MASCO information. The kiosk also collects applications from the commuters that are entered into a ridematching database using our GeoMatch ridematching system.